Will the Sinuva launch propel XENT to a higher level of growth? Intersect ENT Inc. (NASDAQ: XENT) is a small-cap medical device company which competes in the ear, nose and throat (ENT) market. Since January 2017, Intersect’s stock price has grown 181% making it one of the top performing stocks in the medical device space over that period. Intersect manufactures the PROPEL family of products, which are bio-absorbable steroid-eluting implants for patients who suffer from chronic sinusitis and are indicated for use following sinus surgery. Additionally, Intersect launched the SINUVA sinus implant in April 2018, which is used to treat recurring nasal polyp disease and is targeted for use in physician offices. According to management, the ENT device market has a total addressable market size of approximately $3 billion and remains significantly underpenetrated. However, some analysts argue that Intersect’s ability to sustain their high revenue growth will ultimately depend on the success of their SINUVA launch and the continued adoption of PROPEL Contour. In addition, competitive product launches and acquisitions, such as Stryker’s purchase of Entellus Medical, could impact market dynamics. Factoring in these catalysts, how can investors track whether Intersect can continue to penetrate the high growth ENT device market? Guidepoint’s Qsight is the solution. Guidepoint Qsight is a new dataset that compiles monthly purchasing data from over 1,500 U.S. hospitals in near real-time. 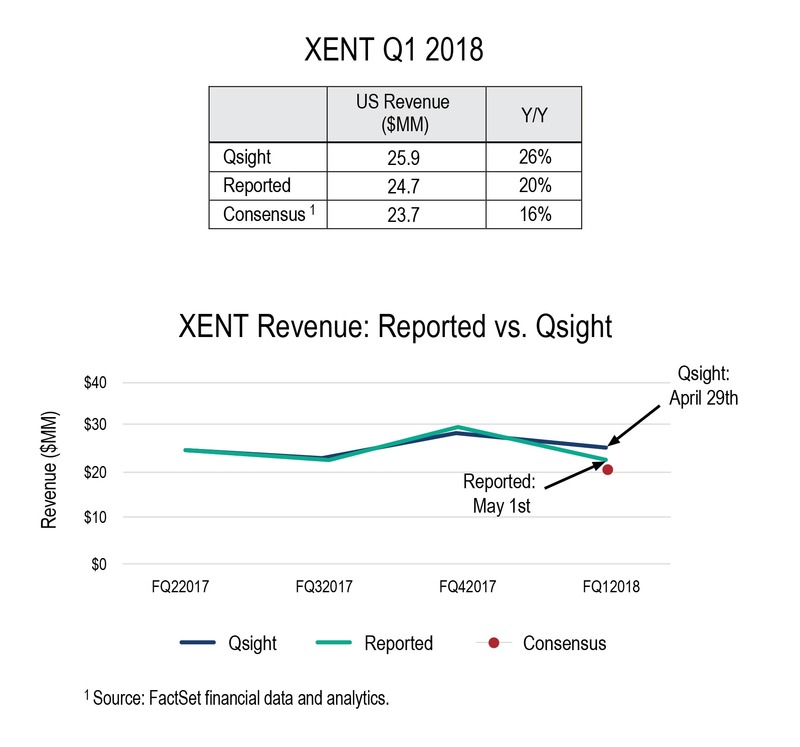 Prior to Intersect’s Q1 2018 earnings release, Qsight’s data and projection methodology showed potential for their revenue to come in above sell-side consensus estimates. On May 1st, Intersect’s Q1 2018 reported sales outperformed Street expectations, sending the stock price up 4% at its high the next day. As an existing or potential shareholder in Intersect, why would you not want access to real-time data on its key products and growth? Guidepoint is not a registered investment adviser and cannot transact business as an investment adviser or give investment advice. The information, analyses, forecasts, metrics, samples, estimated figures, trends, charts, tables, graphs, and projections contained herein or in any Guidepoint Data Product do not represent, contain or constitute investment advice and are not intended as an offer to sell or solicitation of an offer to buy any security, or as a recommendation to buy or sell any security and should not be relied upon as the basis for any transactions in securities.